As shoppers flocked to the long-awaited Market Basket in Revere Sunday, Chief Executive Officer Arthur T. Demoulas said another delayed proposal in Lynn might be breaking ground soon. Demoulas was fired in June by a board controlled by his cousin Arthur S. Demoulas. Employees of the supermarket chain walked off their jobs in protest, and hundreds of warehouse workers and drivers refused to deliver fresh produce to the chain’s 71 stores. 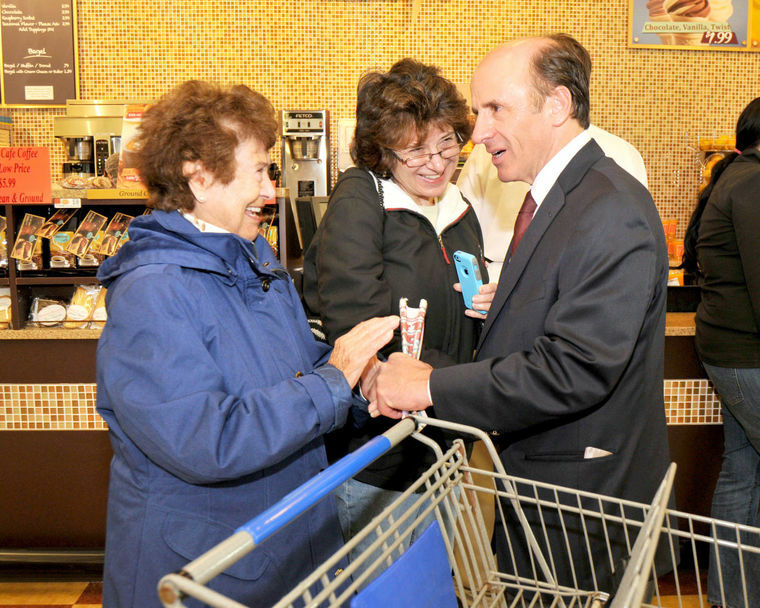 Arthur T. Demoulas was on hand Sunday for the opening of the Revere Market Basket. He said that ground might be broken on the long-awaited store on Federal Street in Lynn this coming spring. Customers soon began shopping elsewhere; some because they could not find fresh food at Market Basket, while others stayed away to show support for the workers and Arthur T. Demoulas. The chain’s owners finally signed off on a plan Aug. 27 to sell the majority of the company’s shares to Arthur T. for a reported financing package of $1.5 billion, including cash and a $500 million loan from a private equity firm. The chain, known for its low prices, lost tens of millions of dollars during the standoff. The dispute also put plans for new locations in Revere and Lynn in limbo. He said he also expected a spring or early summer groundbreaking for the Lynn location. Local shoppers interviewed Sunday would be appreciative. “You have to open up in Lynn, but I’m very glad you opened up here,” Lynn resident Bonnie Maitland told Revere store director Ron Lambert on Sunday. Zofia and Mary Antczak were also shopping at the new Revere location Sunday. “We are very excited because I was getting tired of driving to Chelsea,” Mary Antczak said. Demoulas and Lambert said Sunday that there are other stores scheduled to open in Massachusetts prior to any groundbreaking in Lynn. A store in Littleton is scheduled to open in two weeks; a Waltham location will follow two weeks after that. Then there are stores planned to open in Attleboro and Athol, Demoulas and Lambert said. Lynn Economic Development & Industrial Corporation Executive Director James Cowdell said the city has been meeting with Patsios frequently, and Cowdell remained excited about the project.